A resort and community bordering the Deschutes National Forest. Tetherow came to Savy with a great reputation and presence; they just needed refining. They also needed help with their marketing collateral including signage, event material, menus, and membership forms. 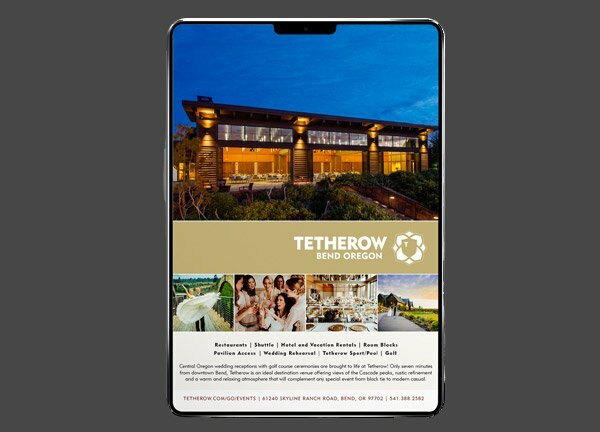 Tetherow required updates to their email marketing templates and ongoing help with creating print and online advertisements. Savy got to work with brand updates across all channels. We rebuilt their email marketing template to look fresh while being much more user-friendly to create. Next came collateral creation including design and copy. We have the capabilities to provide Tetherow with anything from t-shirt design to new menus to membership forms and printouts. Finally, Savy provides ongoing design and copy support by creating Tetherow print and online advertisements and blogging for SEO.